Using spa bromine sanitizers, instead of chlorine. A Popular Spa or Hot Tub Sanitizing Alternative to Chlorine. Managing the Bromine level, of Spa, Swim-Spa or Hot Tub water!!! How to use Bromine, for spa, swim spa or hot tub sanitizing? Bromine is much more popular in spas and hot tubs, than in swimming pools. For use in spas and hot tubs, it is available in two forms: slow-dissolving tablets or a quick-dissolving 2-part system. Bromine, in functioning as a sanitizer, produces less odor than chlorine and tends to be less irritating. The use of bromine is popular as a backup sanitizer or oxidizer for Ozonation, Mineral Sanitizers or Ionization. If problems arise, refer to the Spa Problems Page, as a source of problem-solving information, broken down into various categories. Scroll down the page and click on the linked keywords, catch phrases or images, in the archived answers below, to access additional information, on that topic or product. Hi Alan, I very much appreciate your website and it has answered many questions for me, but this is one question that I have come across that I can't find an answer to. My spa is about 300 gallons, a couple years old with an ozone generator. I was researching why my spa would not hold its bromine level after shocking for very long, and found some negative information about using bromine with ozone generators. The statements I came across basically said that ozone can convert some of the bromine to bromate, which is a suspected human carcinogen. Now I am definitely not a chemist, and when I read information like this it is a bit alarming. I realize bromine is a very popular sanitizer and is undoubtedly used in thousands of ozone spas, so am I a victim of reading more into this than necessary? I figured that if it was really an imminent hazard, in this day and age there would be all types of warning labels stating to not use bromine as a sanitizer. Any enlightenment you can offer would be most appreciated, I'm concerning enough that I'm considering draining the tub and starting fresh using chlorine as a sanitizer. Bromates do fall in the category of being possibly carcinogenic. However, the consensus seems to be agree, that is the ingestion of bromates that poses the greatest risk. There doesn't seem to be any evidence of risk, due to skin absorption or inhalation of the trace amounts, that might exist in an ozonated spa. At one time, there was a combination of a bromine generator, with a built-in ozonator. I believe, it was discontinued because of the concern about bromate formation. So far as I know, there are no warnings about using bromine and ozone, together. If this concerns you, draining the water, and starting chlorine use, will eliminate the potential to form bromates. 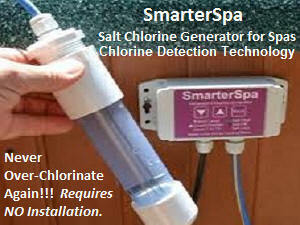 A salt chlorine generator is a convenient way to chlorinate a spa. We offer several models, that require no installation and two of them are "smart enough" to only produce chlorine, when it is actually needed. If used with an ozone generator, the life of the salt cell will be extended and the pH should be less apt to rise quickly. I hope that the information provided was helpful. Hello, Maybe you can clear something up for me. I have a spa and the manufacturer recommended chlorine. They said bromine was "corrosive and damaging to the equipment". I've read chlorine was more corrosive, not as effective and gasses off at higher temperatures. Any idea why they would recommend chlorine? Thanks. Acidic water can be corrosive, whether chlorine or bromine, is used. Copper heater cores are particularly vu lnerable. The most common form of bromine is a tablet, which is acidic. The most common chlorine, used in spas, is close to neutral. That is probably why they are making that statement - it's easier than trying to explain why! If you keep the pH at 7-2-7.8, then it really doesn't matter, whether chlorine or bromine is used, so far as corrosion is concerned. Bromine is less irritating and odorous and is a very popular spa choice. 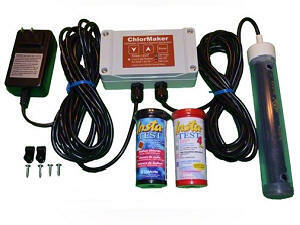 A popular way to use chlorine is with a salt chlorine generator. 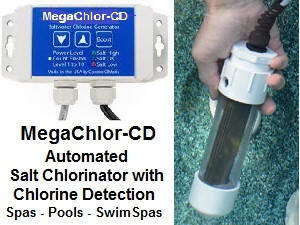 It is easy to use, provides better control and eliminates handling, measuring and storing chlorine. It also makes corrosive low pH very unlikely. I hope that the information provided was helpful. ► When And How To Shock A Bromine Spa? Great helpful site. I looked and you answered this several times in different ways but I am just a bit thick. I use Bromine Tabs. When Bromine is low - should I always shock before I add more Bromine? I know when I shock the Bromine goes up. But, how do I know when putting in the Shock when am I killing micro-organisms and other stuff - and when am I just using real expensive Bromine raiser? Thanks. OK, I'll try to clear this up. When the bromine level needs to be raised quickly, you need to add non-chlorine or chlorine shock. These products will oxidize the bromide ions and form new bromine. This boosts the bromine level, so that wastes are destroyed and sanitation is maintained. When the bromine levels are good, you want a source that helps maintain the bromine level, within the optimum range of 3-5 PPM. Bromine tablets help you do that. With bromide ions present (Your could also add sodium bromide.) chlorine will generate bromine. If you add a salt chlorine generator, it will become a bromine generator. It can simplify the task of maintaining a satisfactory bromine level, by allowing you to dial it up or down. We offer several, affordable models and many require non-installation. I hope that the information provided was helpful. ► Differences Amongst Bromine Tablets? Hi Alan, I just started to use brominating tablets in a floating dispenser in my hot tub and when the bromine level was low, I added some brominating concentrate to quickly bring it up to standards. But, it seems to have affected the water. I also notice that brominating tablets from different companies seem to have different ingredients, as well as the concentration. Can you set me straight on this? Thanks. There are slight chemical differences, in the chemical composition of bromine tablets. Primarily, the differences came about, in order to make them easier to tabletize. It does not affect performance. All of the bromine becomes active. The chlorine reacts with the spent forms of bromine (bromides) and as it is used up, regenerates new bromine. Even though, it shows chlorine and bromine, it all ends up as bromine. Bromine tablets are acidic and will lower the pH and Total Alkalinity. Care should be taken to make sure that the water does not go acidic, as that will eventually lead to damage to the heater. There are other ways to sanitize, that could prove more convenient. A salt chlorine generator will generate chlorine, which will react with the bromides to form bromine. These devices will help you maintain a proper bromine or chlorine level, simply by adjusting the chlorine production. All it takes is a small amount of salt and access to a 100 volt GFI protected outlet. There is no installation required, for any of the four Plug-n-Play models. The addition of a Nano-Stick Clarifier will help destroy ultra-fine particles and help you produce and maintain better water quality. The Nano-Stick lasts for 4-6 months. I hope that this information will prove helpful. ► Getting The Bromine Level Right? 4. have also read about products like "Refresh" and "Peak Boost" to bump up the bromine levels, but I understand there is concern about cyanuric acid build up with these products. I am confused if these are all different systems, or all parts of the whole system. Can you please help me to understand this whole Bromine thing and simplify all this a bit. Feeders always need tweaking, as the bromine level depends on usage and how much bromine is being dissolved. That is where testing com es in. A "bank" refers to a concentration of bromide ions. When you use bromine tablets, you create a reservoir of bromide ions. If the bromine level is low, just add a small amount of sodium dichlor or potassium monopersulfate (non-chlorine shock). This addition will convert the bromides back to bromine. You need not be concerned, about a cyanuric acid level buildup, as the bromine is unaffected. In addition, spas are generally emptied, every 3 months. to avoid such buildups of chemicals and byproducts. Adding a Floating Solar UV Sanitizer, can reduce the amount of chlorine or bromine required, to maintain any given level, by 50% or more. Ambient or sunlight exposures are enough to activate and keep the unit charged, for days at a time, even if the light exposure is limited to only when the spa is actually being used. It really works well with bromine, to reduce the overall chemical usage and provide better results. I hope this information is helpful. ► Using Chlorine To Generate Bromine? I hope this is not a redundant question but I could not find a specific answer on your site. After pouring over your site for the last few weeks, I made the decision to switch from chlorine to bromine in our spa. I purchased a product billed as brominating granules: one-step sanitizer & oxidizer. When I got home, I noted that this product has 82.5% Sodium Dichloro-s-triazinetrione and only 14.7% Sodium Bromide. I think I understand from the detailed information on your site that the bromide will be converted to bromine in the presence of some chloride ion, but am I really moving away from chlorine sanitizer with this product? Could you also help me understand 1) how exactly this product works, 2) how I should use this product after a new tub refill and maintenance, and 3) how I should combine the use of these brominating granules with bromine pellets in a dispenser? For example, would I only need to use these brominating granules, only pellets, or some combination of both. If it matters for your answer or our choice of sanitizing, our house came with a very old spa dropped into an above ground deck (not well insulated). We are only weekend spa folks and tend to heat the spa up on Friday afternoons and turn off the heat Sunday night but we do have the pump circulating water 24/7. Thank you so much for your forum. It is by far one of the most detailed and informative that I could find on the web! Last letter for 2012. Happy New Year!!! With bromine, hypobromous acid is the active sanitizer and with chlorine, it is hypochlorous acid. If you start off with bromine, you build up an excess of bromide ions. If you add chlorine, it converts the bromides to hypobromous acid. If you start with chlorine and add bromine, the bromine remains as hypobromous acid, until it is depleted. Then it reverts to bromides. Adding chlorine will convert the bromides to hypobromous acid. In other words, if there is excess bromides ions, it all ends up as bromine, no matter what you add. The chlorine is reduced to chlorine ions and the bromide ions are oxidized to hypobromous acid. The product you are using is merely combing sodium dichlor and sodium bromide. Once added, to the water, it will end up as bromine. You can add a monthly dose of a sodium bromide product and then follow with sodium dichlor or even non-chlorine shock. In the latter case, it is sold as a 2-part bromine system. It really is bromine and the odor, or its greatly reduced lack thereof, is an indication of why most people prefer bromine, for spa use. You have the option of using bromine, in tablet form, in a floater or feeder. You can use a combination of products, with the intention of maintaining a 3-5 PPM level of bromine. 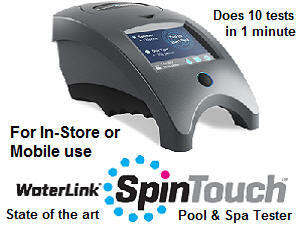 If you add an EPA registered as a Spa Mineral Sanitizer, you should be able to get by with a bromine level of 1-3 PPM. I hope that this helps explain how chlorine ends up as bromine. ► Bromine: the 2-part version? I can understand how the bromine tablets work. That's fairly straightforward. The 2-part bromine seems a bit confusing. I'm using it, but I don't really understand how it produces bromine. Can you help? There are 2 products that comprise the bromine 2-part system: a liquid product containing a concentrated solution of sodium bromide and a granular product containing the oxidizing agent potassium peroxymonosulfate (also called potassium monopersulfate or monopersulfate comp ound). The liquid product is typically added only once a month. Adding more will not produce more bromine. The granular product is usually added on a daily basis or, as needed, and it is this product that results in bromine being produced. The potassium peroxymonosulfate reacts with the sodium bromide, already in the water, and forms bromine. Add more potassium peroxymonosulfate and more bromine is produced. After, the bromine has been consumed in the sanitizing process, it reverts back to sodium bromide, allowing for the cycle to be repeated. The sodium bromide product is added monthly to assure that there is always an excess amount of bromide, available to be converted into bromine. The water can be tested for Bromine and adjusted accordingly. The advantage of this method is that it is quick dissolving and allows for flexible control of the bromine level. The 2-part system produces no organic byproducts and contributes only harmless, innocuous salts to the water, after the sanitizing is completed. Hence, never a build-up problem. These products are pH buffered, so as not to have a major impact on the pH. The only downside is that you have to add it more or less on a daily basis. Adding a Nano-Stick Clarifier, which requires no installation and lasts 4-6 months, will help destroy ultra-fine particles and help you produce and maintain better water quality. I hope that I succeeded in explaining the product. Enjoy the spa. ► Use Of A Floating Feeder? Hi! I read your article, "Bromine for Spas", but I could not find any information as to how to actually add the tablet to the water using a floater. I was curious as to if you could give me a description of how to do this. For example do I leave all tablets in the bottle and put it in the tub? Or do I put one tablet in the floater? Thanks! A simple enough question that seems not to have been asked before! A floating feeder for a spa is relatively small (compared to pool feeders) and probably is able to contain 6-12 tablets, depending upon the actual design. Start by filling the feeder and trying to keep the feeder relatively full, by adding more tablets 1-2 times weekly. Do not allow the tablets to completely dissolve before adding more! Keeping the feeder reasonably full will help allow for a more consistent dissolution of the product. Use the adjustments for opening and closing the water vents, to help maintain the bromine level at 3-5 PPM. Bromine tablets are slow dissolving and do not play catch up very well. You should add some shock, after periods of heavy bather usage or whenever the bromine level has bottomed out. Consider adding a Salt Chlorine Generator, as it will provide better results, than using traditional chlorine and it easier to use, than bromine tablets. I hope that I have been helpful and enjoy the spa. ► Wanting To Use Less Bromine? I have been using bromine tablets in my spa. The results, so far, have been good, but I would like to use less bromine and fewer chemicals. Any suggestions would be appreciated. Regards and thanks. The simplest thing to do would be to add a Solar UV Sanitizer and can be used in all spas, that use bromine or chlorine. It is activated to long periods of time, by even short exposures of ambient light. It will not interfere with the water chemistry, but should reduce overall chemical usage. The presence of the Solar UV Sanitizer will allow you to reduce bromine usage and the overall water chemistry will be easier to control. I hope that this information proves helpful. Alan, we used bromine in our hot tub but it irritated our skin, in order to switch to a chlorine, do we need to empty our hot tub and start it from scratch with chlorine, or can we just convert over? Thanks. You must completely drain the spa, removing as much water as possible. Otherwise, the bromide salts, remaining in the spa water will convert the chlorine to bromine. The fact that you described the rash in the plural (we) leads me to believe that the problem may not be the bromine. Bromine tends to less irritating than chlorine. A rash could be the result of too much bromine, too high or low a pH or inadequate spa water sanitizing. If after converting to chlorine, the problems cease: great! However, if problems continue, I suggest that you consider the addition of an ozonator and reducing the level of chlorine or bromine. The use of a mineral sanitizer or ionizer and an ozonator is a viable option, that utilizes a very low level of chlorine or bromine. I hope this information will solve the problem. Good luck. My husband and I have been given 2 pieces of advice and wish to find out which one we should follow. At the present time in our Hot Tub we chlorinate and then we test the level and add Bromine tablets to the floater to maintain the chlorine level.. This was told to us by one company. This past month we went to the place we bought the hot tub to purchase needed chemicals and told them what we needed and were told to NEVER use chlorine and bromine together. We have not had any trouble before this advice and were wondering which method of maintaining the chlorine? I would appreciate your advice on this. Thank you. There is nothing wrong with what you are doing. After bromine has reacted with wastes, it forms bromide ions. Adding chlorine converts the bromide ions back into bromine. Read the label on the bromine tablets. It contains both chemicals and works, as I outlined. What you are doing is maintaining the spa on bromine and using chlorine to shock and that is normal. You should be testing for bromine and trying to maintain 3-5 PPM. If you want to be able to lower the bromine level, add a Solar UV Sanitizer, which helps eliminates wastes, that would, otherwise deplete the bromine level. Make sure that you are testing for Bromine. A product, such as the LaMotte Insta-Test Strips, provides the right kind of information and is ideal for this purpose. I hope that I have been helpful. ► Using Bromides With A Salt Chlorine Generator? We have a 400 gallon hot tub that we sanitize by way of a salt water chlorinator. My question is that if we were to add a product such as sodium bromide to the hot tub, would it convert it to a bromine base versus a chlorine base? Would the salt water generator still work and would it then produce bromine instead of chlorine? I had read somewhere, that if this was done, then you would have to add enough bromide ions as to equal 50 ppm? Is this correct? Any info you can provide on this would be appreciated. If you have bromide ions present, the chlorine (hypochlorous acid) will react with the bromides and convert it to bromine (hypobromous acid). This will happen with a salt chlorine generator or any other method of adding chlorine. It will end up as a bromine spa. However, not all manufacturers of salt chlorine generators recommend that their product be used, in this manner, as it could shorten the salt-cell life. However, the reasoning behind this applies to pools or spas that are constantly exposed to the Sun. Most spas to do not fall, into this category. Good luck and I hope that I have been helpful. ► Using Chlorine and Bromine Together? My husband uses bromine tablets in a floating feeder and uses a chlorine shock treatment in our small hot tub. Is it okay to mix these or should he be using a non-chlorine shock? I ask because sometimes I go into the hot tub and there's an odor that slightly hurts my lungs to breathe and makes me cough. He says bromine and chlorine are the same and it's fine, but I'd like your opinion. Also, how often should you use shock? I think he does it once a week even if the bromine level is fine. Thanks. There is nothing wrong with using bromine and chlorine together in the same spa, but they are NOT the same chemical. Bromine tablets actually contain both chlorine and bromide. In the presence of bromide ions, which will come from the bromine tablets, the chlorine will c onvert to bromine. Adding some granular dichlor is an easy way to boost the bromine level, after periods of heavy bather use or due to low bromine levels. A salt chlorine generator will end up producing bromine, if a few ounces of sodium bromine are added, along with the required amount of salt. This addition is only required once, after each refill of the spa. Bromine tablets are acidic and will cause the pH to drop, unless soda ash is added. The low pH is corrosive to equipment and very likely to lead to irritating vapors. Check the pH! You should shock, after periods of heavy bather use, whenever the bromine level bottoms out, at first signs of a loss of water quality or periodically to prevent the buildup of contaminants and resistant microorganisms. The use of a Mineral Sanitizer can reduce the amount of bromine required and provide more consistent conditions. I hope this information is helpful. Hi there. Just wondering how environmentally friendly bromine is when you empty your spa water containing bromine on your lawn. Thanks. Draining a spa onto a landscaped area is always second best to draining it away from vegetation. However, ultimately it all ends up in the same place. The spa does not contain herbicides or chemicals that are expected to cause landscaping or environmental damage. I hope that I have been helpful. ► Chlorine Tabs Vs. Bromine Tabs? The other day, while picking up some more bromine tablets, I was browsing the chemical department and came across a product that was 1" chlorine tablets. It contains 90% chlorine and will fit into my bromine floating feeder. It was a lot less expensive. Can this be used? The bromine tablets that you are using are slow dissolving in your spa. This is important in order to provide a continuous release of bromine into the water. The chlorine product that you described is intended to be used in a swimming pool. This product is slow dissolving, as used in a swimming pool. However, at the temperature of most spas (104ºF), these tablets will dissolve too quickly, making it difficult to control the chlorine and pH. Trichlor is not recommended for use in a spa, in any form. Stick with the bromine -- you'll have less work and less odor. I hope that I have been helpful. ► Test Results Not Matching Colors? Well, here's the deal. I switch to bromine I never emptied tube I was told no need to. Anyway, I added the bromine tablets to feeder and I added the bromine shock to start a bank as well. got no reading so I shocked it with non-chlorine well that gave me a good dark reading above twenty plus. I did this since the place I brought my water sample to said I needed to break the barrier. I know I got bromine you can smell it now. After the non-chlorine burns off the next day I take a test and it’s a off pink color on a DPD tester I have added tap water to tester as well to see how it brings it down, but color never seems to match the test block really well. I let it go down to the point on tester were there was no color and added more non-chlorine again today and it went back up, but color still off. The place I bring the water to said just let it burn off you will be fine, but, as I said before it goes from a pink to nothing. Can you help? Must be something to get it to look right on tester. It’s a 1000 gal. hot tub Please help. Find another way to add tablets! Otherwise, you could destroy the heater, if the pH falls into the acidic ranges. Bromine table ts are acidic. Try a floater or a inline bromine feeder, placed after the heater and equipped with a check valve. Depending on bather usage, bromine alone might not be the best solution. Consider adding an ozonator, ultraviolet sanitizer or mineral sanitizer or switching to a salt chlorine generator, which can provide more control and better results. It sounds like there was a lot of material for the bromine to react with and it may take a day or more for all of the organics to be destroy. Try and keep a bromine level at 3-5 PPM. Unless you added sodium bromide, the chlorine part of the bromine tablets, may take a while to convert to bromine. Bring in a water sample to a local dealer and compare the test results, with your own. Your test chemicals may be outdated or need replacement. Personally, I would choose a test method, that eliminates the color-matching and guesswork. A ColorQ PRO 7, all-digital water tester, would be an ideal choice. I hope that this information proves helpful. ► What Is A Bromide Bank? I am using bromine tablets and was told that I need to add something to create a bromide bank. Why? What is it? Thanks. A "bromide bank" means that there is excess sodium bromide present in the water. The bromine tablets actually contain a mixture of bromine and chlorine. As the tablets dissolve, the chlorine will react with BROMIDES present in the water and will be converted into BROMINE. In a freshly filled spa, there are no BROMIDES present. To make sure BROMIDES are present and available to react with chlorine, a liquid sodium bromide solution (The Bromide Bank) is added. This is only done when the spa is freshly filled or refilled. By doing this, there will be none of the odor that can be associated with chlorine usage. I hope that I have explained the product. Enjoy the spa experience. ► Very High Bromine Levels? We have emptied and refilled the hot tub twice now and the bromine count still reads almost 20. The second time the alkalinity and pH came into the acceptable ranges, but the bromine is way too high. The tub was emptied due to folliculitis. Is there any other way to decrease the bromine level so it is comfortable to use the spa again. Thanks. Only two possibilities. Your test kit is not reading properly or you are really adding too much bromine. A level of 3-5 PPM is reco mmended. The folliculitis could very well have been caused by too little bromine, which lead to inadequate sanitation. Sometimes with bromine there is interference with the pH test. Are you positive that you are reading PPM of bromine? Have you had a dealer confirm these test results? You could be adding too much product at a time. If you are using a monopersulfate shock, it WILL raise the bromine level, as will all forms of chlorine. There is no reason that a refilled spa should have a very high reading, unless too much product has been added. If you have added too much, you can lower the level by adding a chlorine/bromine neutralizer product. As a means of simplifying the sanitizing, you might think about adding an ozonator and a mineral purifier system or switching to a salt chlorine generator, which can provide more control and better results. It will allow you use fewer chemicals and afford better water quality. I hope that the information proves helpful. Enjoy the new year.